Alvin Connerley passed away Saturday, November 17, 2018, at his home in Lewiston, Idaho, of causes related to age. He was 89 at the time of his death. Alvin was born June 6, 1929 in Buhl, Idaho, to Everett William Connerley and Nellie Dancel Davis Connerley. He was the second of five children: Lucille Marine Maddocks, Juanita Hazel Qualls, Mary Lou Olsen and Arlie Dean Connerley. Alvin’s family moved to Twin Falls, Idaho, when he was a young child. Growing up he loved horses, playing football, hunting and fishing. Early in life, working with his father, he displayed his remarkable lifelong work ethic. He attended Twin Falls High School. Many adjectives describe Alvin including stubborn, self disciplined, fiercely independent, stubborn, frank, unassuming, ingenious and quietly committed to his family (did we say he embodied stubborn?). He was affectionately known as Al, Dad, Grandad, Pop Dad, Big Al, Uncle Daddy, Little Buddy and Alvie.Alvin met Luana Scholes in 1946 while in high school. They married on February 2, 1948, eloping to Elko, Nevada, and started their life journey with $13 between them. They initially made their home in Twin Falls, Idaho, where Alvin built their first family home working on it after hours and with their earned cash. They resided there and started their family of five children: Dirk Connerley (Marlys) of Culdesac; the late Byron Connerley, Kathleen Connerley (Spud Storey), Christine Connerley (Randy Chapman), and Janene Connerley (Joe Smith), all of Lewiston. In 1956 they started living a nomadic life throughout the Pacific Northwest due to Alvin’s occupation as a bridge builder and Lou’s unwillingness to have the family separated. They lived with their growing family in campers, small homes and often in remote areas. They first resided in Lewiston, Idaho, from 1959-1962, when Alvin oversaw the building of the Spalding Bridge. While in Lewiston he flew in an airplane for the first time in 1960; he fell in love with flying, and by 1961 had his pilot’s license. He flew extensively as a component of his building occupation, and partnered with his brother in 1962 to purchase his first of many planes. In time he and Luana purchased and operated Lewiston Aviation. In 1964 Alvin & Luana started their own independent contracting business in Butte, Montana. They relocated back to Lewiston in 1965, where they continued to develop A & R Construction Company. His brother Arlie joined him in Lewiston to work with Alvin and Ron Gunther to develop A & R into a thriving business. Alvin was a skilled contractor, adept in all aspects of building and was self-educated in engineering. There was nothing he could not build or repair. He was ingenious and had a remarkable ability to problem solve, and as was often attested by wife and daughters, he could create a solution for any encountered difficulty. Although his company was a general contracting service, bridge construction was a cornerstone of the business. It has been estimated that he oversaw the building of more than 600 bridges in the Pacific Northwest. It would be impossible to drive across Idaho and not cross one of these bridges. To this day whenever we cross a bridge all of his children will say “is this a bridge Dad built?” As an adjunct to his contracting business he and his brother also started the “Local Saw Shop” on Thain Road in Lewiston, using their father’s equipment.While living in Lewiston in the ’60s, Alvin was introduced to trapshooting, which he quickly embraced as a new adventure. He earned many awards and was soon a AA/27/AA shooter. He shot trap throughout the United States. 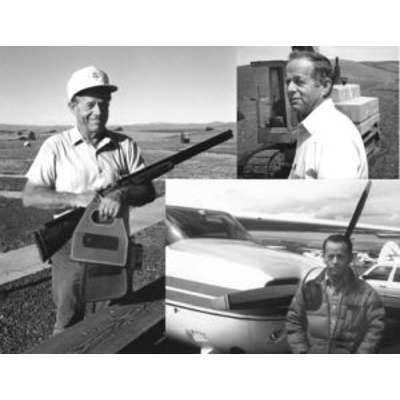 In 1976 he and Luana began traveling to Arizona each winter to participate in the trapshooting winter chain. Following Luana’s death in 2007, he continued to travel to Arizona every year through the remainder of his life, accompanied in later years by companion Jean Ballard. Alvin was well known on the trap line for his wit, fierce competitiveness and great sportsmanship. 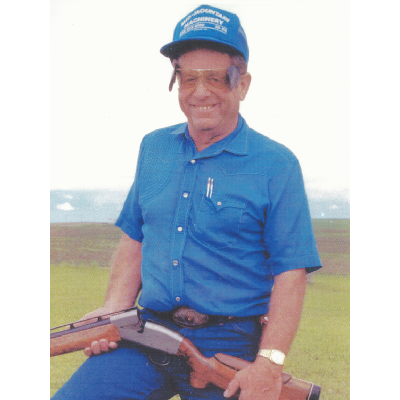 Alvin was inducted into the Idaho Trapshooting Hall of Fame in 2004; he was one of 77 people to have earned the 500,000 target award by the ATA; through his shooting career he shot 804,425 registered ATA targets and was a national leader on number of targets shot in the ATA. He also enjoyed shooting many registered PITA targets. Alvin thrived on work; it was his life passion and he embraced it with enthusiasm. He would work long hours, seven days each week, but our Dad always said “I never felt like I went to work a day in my life”. Despite frequent relocations in the early years of their marriage, with Lou as his partner, he was a quiet constant presence and they maintained a sense of home, balance and tradition wherever they lived. Lou and Al always had a special relationship. They were best friends since their teens and throughout their shared lives they epitomized a loving and caring relationship. Luana was known to say “we started with $13, and with perseverance, hard work and sacrifice we achieved every dream we ever had.” As part of their dream they created a home and family that includes their five children, 15 grandchildren, 24 great-grandchildren and one great-great-granddaughter. Alvin was preceded in death by his parents, siblings, wife Luana and son Byron. Alvin experienced a number of health challenges during his later years. Despite his health challenges he never lost his zest for work, or his inherent tenacity for life. He left a legacy of life that will always be treasured by his family and many friends. A friend recently commented: “even a good life lived is hard to see end for those of us who were so influenced and loved by these wonderful people.” Alvin, with wife Luana, epitomized the American Dream and provided a legendary example of life to many, in particular to his children and grandchildren. He was and will always remain a hero to many, in particular his children. The family suggests donations be made in memory of Alvin to the following organizations, or to a charity of choice: Idaho Trapshooting Hall of Fame (monies used for scholarships and ID HOF museum) 602 E. Linkershim Drive, Meridian, ID 83642 or First Step 4 Life Community Recovery Center, 703 Eighth St., Lewiston, ID 83501.